Special Benefits for Military: Reduced Rate: Get 4% APR on all balances for up to 12 months during deployment or PCS. After 12 months, the variable Regular APR of between 9.15% to 26.15% will apply. This rate will vary with the market based on the prime rate. 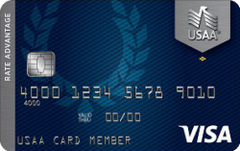 Our take: The USAA Rate Advantage Visa Platinum Card offers a low APR that is hard to beat, but it lacks a zero percent introductory offer, and the card is not available to the general public.